Our level of online connectedness means we're less patient than ever; the greatest threat from A.I. 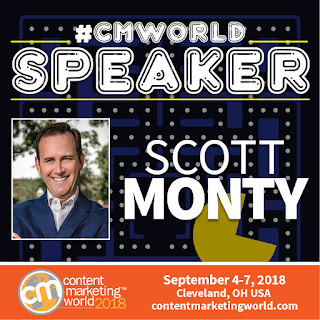 isn't robots – it's us; going driverless in California; content can build and support social proof; if you want more customers, stand for something; Amazon's Trojan horse is in your kitchen; what platforms have the attention of teens; Instagram needs the same level of scrutiny as Facebook; Microsoft commits to developers; programmatic ad buying in podcasts; when it comes to audience growth, remember the denominator; the first cyberattack is older than you thought; coming IPOs in the on-demand economy; the biggest threat to our data security is our own ignorance and laziness; CFOs look askance at marketing because of vanity metrics; why we don't answer the phone any more; plus the podcast of the week, wants and offers in the Community section and more in the Anticipation edition of The Full Monty from Brain+Trust Partners for the week of June 4, 2018. Please consider supporting the considerable effort made for you here each week. The Full Monty, a Brain+Trust Partners publication, exposes you to virtually everything you need in business intelligence at the top of every week. Links are below with commentary in italics. Please sign up for our email updates to make sure you don't miss a thing. The Top Stories section continues to highlight an issue that's reflected in a few links. For a deeper discussion, listen to the The Full Monty podcast, with new episodes each Wednesday. If you'd like the facial expressions that go along with it, our YouTube channel should suffice. The entire online world waited, and we got what we were waiting for last week: Mary Meeker's annual Internet Trends Report. It contained most of what we have come to expect: a look at usage and growth, and which technologies should be on our radar. This year, China is ascendant and it looks as if mobile and Internet growth has plateaued. But what that means in practical terms is that consumer habits in the world are becoming more similar. With the power of information and near-immediate access to goods and services, we're expecting and demanding more. So in the age when Amazon can deliver a package within hours and Uber and Lyft apps show us how many minutes until we're picked up, why is it that we're still impatient? In short, because technology ruined it for us. The "Buy It Now" buttons on Amazon and eBay have created a new level of expectation, just as the "request a ride" button has put certainty into what was once a crapshoot of taxi-hailing. But rather than the effect staying with those verticals, it has crept into everything. McDonald's mobile order and pay service is great, but you can't submit the order until you've arrived at the restaurant (and it is fast food after all - how much time are you really saving? ), which can annoy people. And don't even think that buying a car is universally as easy as an Amazon order –although places like Paragon Direct (client) are solving for that. We're even impatient with the streaming media we watch, using two screens to "multitask" when we've got our favorite shows on. It has led to a decline in the number of commercials that we watch, and forced providers to eliminate the ability to fast forward through ads. So, the consumer just puts her attention on a different device for 30, 60, or 90 seconds. 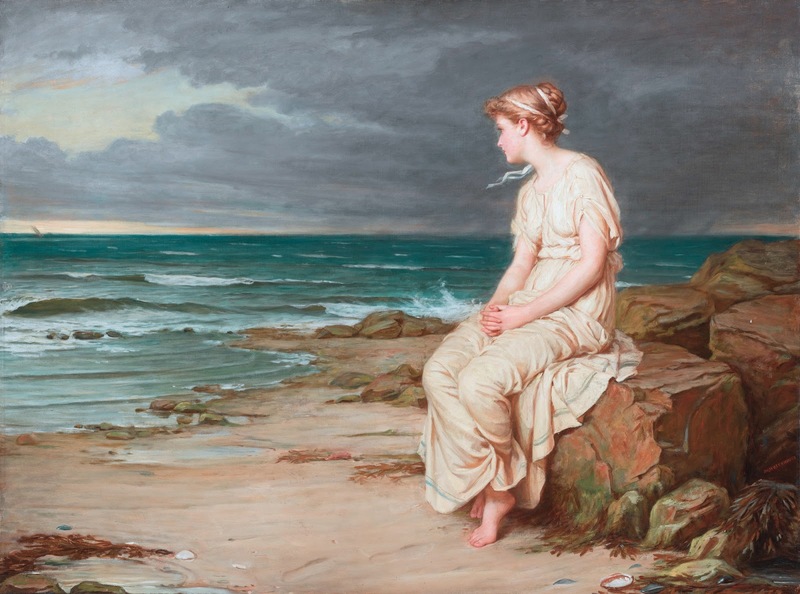 We need to dig deep within to find at least one of the Seven Virtues – namely, Patience. It is associated with the traits of forgiveness and mercy. Think of how much happier we and the brands we use might be if we were a little more patient and magnanimous in our expectations. The latest in AI, machine learning, bots, and blockchain, mobility, and autonomous everything. The greatest threat that humanity faces from artificial intelligence is not killer robots, but rather, our lack of willingness to analyze, name, and live the values we want society to have today. By John C. Havens. Axios has a wide-ranging look at how the robot revolution is changing our lives, for the better and worse – from healthcare and fewer back-breaking jobs, to very real impacts on truckers and agriculture workers, to more talk about "automation anxiety." Another source says that even in a world of robots, continuous education can keep people employed. Assuming people want to be continuously educated, that is. There has always been a cult of ignorance among a portion of the population – and that may be the same portion that's skeptical of A.I. Whatever the future holds, there are plenty of topics to debate regarding ethics and robotics. California announced pilot programs for autonomous vehicles, allowing companies to offer passenger service with or without a trained driver; the only stipulation is that rides must be free. Waymo is buying up to 62,000 Chrysler minivans to support its own autonomous ride-hailing service. This is in addition to the 20,000 compact cars it's buying from Jaguar Land Rover. It's a mobility conflict in San Francisco, as protesters use electric scooters to blockade Google buses. It's the most San Francisco thing ever. Industry developments and trends, including advertising & marketing, journalism, customer experience, content, and influencer relations. One of the most compelling reasons that consumers buy is because of peer recommendations. It's not too much of a stretch then to consider using content to build social proof. Now that we're nearly halfway through the year, here's a look at the factors that are shaping content marketing, from team structure to remarketing, voice search, data, and personalization. Increasingly, we're seeing consumers demanding more from brands with regard to demonstrating what they stand for. As a result brands that are unwilling to commit to a set of values risk losing customers. The function of public relations has the opportunity to win back eroded trust in a post-factual era. Truth, accuracy and ethics will rule the day. When more companies, executives and celebrities are stepping in it every week, perhaps it's time to consider better apologies and actions. Humans are a transactional species, and the practice — if not the very notion of what retail is — is undergoing a historical metamorphosis. Sears will close 63 more stores as sales trail off and losses continue to mount. This is in addition to 400 stories it closed in the last 12 months. The retailer is also still looking for a home for its Kenmore brand. Walmart is offering employees the opportunity to get a college education for just $1 a day, as long as they're studying business or supply chain management. This is amidst a battle to attract and retain workers in a competitive labor market. Amazon Echo owners have increased their spending with Amazon by 29 percent. If there were any question as to why Amazon is focusing so heavily on smart speakers, this should lay doubts to rest. Similarly, Fortune takes a look at how Amazon plans to use Whole Foods to dominate the retail industry. McDonald's is planning to add 1,000 ordering kiosks each quarter. As society gradually moves to a cashless system, we've often wondered how one might tip doormen, shoe shiners or street performers. London has a new plan to equip street performers with contactless payment kiosks. The technology is in collaboration with Swedish payments firm iZettle which PayPal bought for $2.2 billion. Want to know what 500 marketers (budgets up to $10 million) believe and how those beliefs influence their behaviors when it comes to hiring and firing agencies just like yours? Don't miss this FREE 16 page report, full of information, insight and guidance on how to best approach prospects based on the findings. Some of the results are going to really surprise you. If you're seeing this, maybe you'd like to see your company's name here too. Let us know. News to know about relevant social, virtual, and augmented reality platforms that may affect your business. Pew Research has released its Teens, Social Media and Technology 2018 report. It found that YouTube, Instagram and Snapchat are the most popular online platforms among teens (no surprise). Fully 95 percent of teens have access to a smartphone, and 45 percent say they are online "almost constantly" (no surprise there either). Also, there is no clear consensus among teens about the effect (positive/negative) that social media has on the lives of young people today. Facebook held its annual meeting last week, and Mark Zuckerberg stuck to the same talking points from his Washington and Brussels appearances, frustrating shareholders who wanted to see some appreciable reforms. WhatsApp is a black box for fake news, and Verificado 2018 is doing its part to combat that. Amid all of the scrutiny that Facebook is receiving for fake accounts, data sharing and the like, Instagram is operating beneath the radar as it runs questionable ads. When will we demand more of Instagram, which is Facebook after all? Now (not) trending: Facebook is removing the Trending section from the site, to "make way for future news experiences" on the platform. Google launched an app for discovering recommendations of locals. Neighbourly is available in Mumbai on Android, but is widely seen as a test market. People still care deeply about local activities and news, and having hyperlocal social proof is a solid move. Microsoft is buying GitHub for $7.5 billion, in a move to lend more support to developer innovation. Reddit surpassed Facebook to become the third most popular site in the U.S., according to Alexa rankings. Only Google and YouTube are higher. The latest in the world of streaming video, audio, and the advertising, pricing and bundling models related to them. The satellite TV industry is struggling with cord-cutting. The main reason satellite companies are in a bind is because they lack widespread broadband services to recoup the cost of people ditching pay-TV packages. Exclusive audio content for subscription podcast publishers is difficult for both the producers and consumers of such content. Primarily because there is no easy way to deliver that kind of content through Apple and Google, the two dominant podcast platforms. DoubleClick Bid Manager is opening up to digital audio ad buying on a global scale. Advertisers can buy digital audio ad inventory programmatically on Spotify, TuneIn, SoundCloud and Google Play Music. When you're thinking about the growth of your podcast's audience, focus on the denominator. That is, don't preach to podcast listeners – sell the content, not the medium. Program of the Week: Our pick this week is the Waking Up Podcast. Join Sam Harris—neuroscientist, philosopher, and best-selling author—as he explores some of the most important questions about the human mind, society, and current events. Do you have a program to recommend? Add yours to our Google Sheet: smonty.co/yourpodcasts. A place for subscribers of this newsletter to help each other. Do you have a special request or need? Email us and each week, we'll pick one to feature. And hopefully the power of the crowd will work. As Marcus Aurelius wrote in Meditations, "...help men. Short is life." This week, the request comes directly from my own team: do you or any leaders on your team need a current state of the industry deep-dive? What's hot in digital and social, and what's coming next? Brain+Trust Partners can help with an executive briefing. Gather as many or as few of your team as you like and book us for an hour, a half day or a full day and we'll share our perspective, shaped by years of brand-side experience and partnerships with technology companies. Can we help you with anything? Send an email to fullmonty [AT] scottmonty [DOT] com with your request and we'll see if we can get it into a future issue of the newsletter. Business disruptions in the legal, regulatory, and computer security fields, from hacking to the on-demand economy and more. Maria Konnikova let us know about this one: the first cyberattack took place 200 years ago. Good old human nature. "There is nothing new under the sun. It as all been done before" – Sherlock Holmes. Smart speakers are vulnerable to a variety of attacks. "Alexa, put up a firewall." It's pretty simple: if you care about data, change these 15 default privacy settings. The biggest threat to our data security is our own ignorance and laziness. 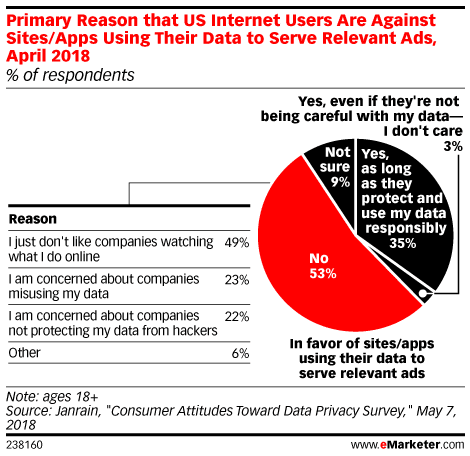 In an April survey of 1,051 US adult internet users by Janrain, most respondents said they are not in favor of websites or apps using what they learn about them online to target ads. Nearly 70 percent said they'd like to see the U.S. enact a law similar to GDPR. CEO Dara Khosrowshahi says that Uber is on track for an IPO in 2019. Brian Chesky, CEO of Airbnb indicated that 2019 could see an IPO for Airbnb as well. The on-demand economy has reached its peak: Katz's Deli started a subscription service for its famous pastrami. Should we plan a meat-up? The future is not in plastics, but in data. Those who know how to measure and analyze it will rule the world. Here are the first things you should learn as a data scientist. And they may not be what you think. In a March 2018 survey of 50 CFOs in the U.S., 36 percent of respondents said one of their biggest concerns about the digital marketing at their organization is that they measure in vanity metrics. If you want your digital marketing team to be thought of as a profit center instead of a cost center, measure success in terms of concrete business outcomes. In a world beyond AVEs, learn to measure for brand awareness and sales. Part One of a series on Measurement in the PESO Model by Gini Dietrich. Part Two of Measurement in the PESO Model looks at how you start to measure results. You track all the places you are placing content, and the resulting traffic to your website, and the conversion of those from visitors to potential clients. Other links to help you reflect, improve, or simply learn something new. We walk around with them in our pockets you probably even have one in your hand right now. And yet we've discarded over 100 years of manners and behavior, as society has crept to this moment. From The Atlantic: Why Doesn't Anyone Answer the Phone Anymore? A tale of deception and greed in a city filled with equal amounts of each, as well as the cultured elite. And it stands in parallel to how social media profiles can make us seem like something we are not: How Anna Delvey Tricked New York's Party People. A fascinating long read. A look at the psychology of money: the paradox of wealth is that people tend to want it to signal to others that they should be liked and admired. But in reality those other people bypass admiring you, not because they don’t think wealth is admirable, but because they use your wealth solely as a benchmark for their own desire to be liked and admired. The summer travel season is upon us, so these 13 brilliant tech hacks for your next trip should be useful. Disengagement isn’t a motivation problem – it’s biological. Our brains are built to get excited about new things. Here are three ways you can trigger your brain to release dopamine even when you’re doing something boring. Why everyone loves macaroni and cheese, or a people's history of mac and cheese. Just because we can all use this from time to time: 20 habits that will make you happier. Aside from eating more mac and cheese, that is. Do you like what you see here? Please subscribe to have trends on digital communications, marketing, technology and business delivered to your inbox each week. It takes many hours to assemble this newsletter each week. How'd you like to do your part in showing your appreciation?. Digimarcom in Houston on June 7. 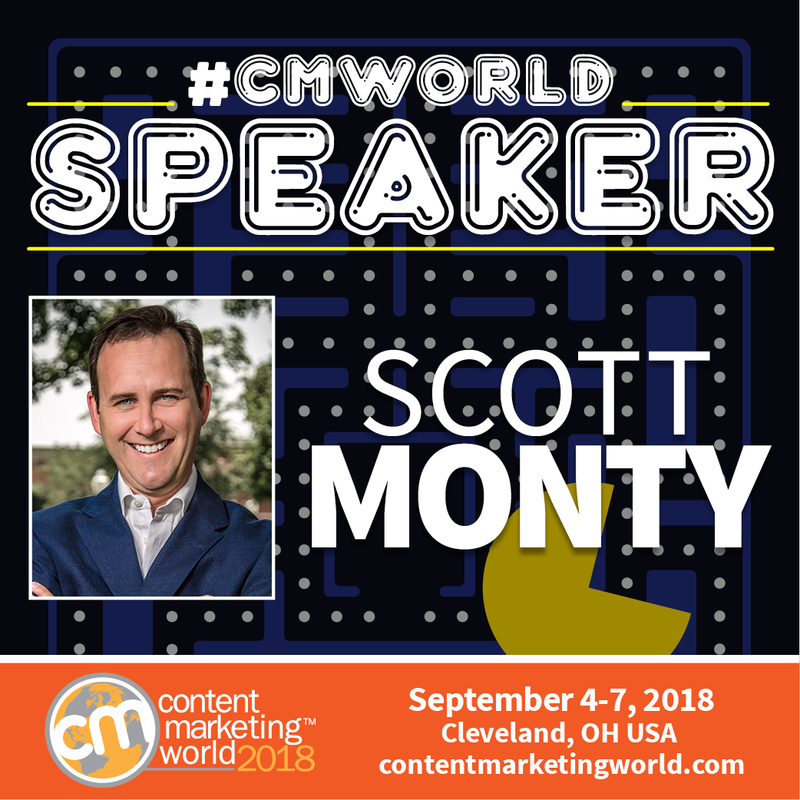 Content Marketing World in Cleveland, September 4-6. And YOU can register here, with $100 off by using the code BRAINTRUST. Can we speak for your organization or event? Drop us a line. Brain+Trust Partners companies evolve at the speed of customers. From social and content strategy development to technology vendor selection, to improved operations, our focus is on helping companies craft one true view of the customer. And our decades of experience working for major brands means that we deeply understand the challenges you're facing. Let us know if we can help you.